Many of the books I used as references are listed in the bibliography, and most of these are still in print or available on the used book market for those who wish to learn more. Below are links to locations online where these are available for purchase. I have listed the sources in order of my purchasing recommendations. Railroad historical groups are listed first, as proceeds from sales support their various preservation efforts. Publishers are listed next for those books still in print. Next comes Powell's Books, an independent, new and used bookseller located in Portland OR, and finally, of course, Amazon.com. And, if you can't find what you're looking for, there's always e-(buyer beware)-Bay. Disclaimer: I cannot assume any responsibility for any title's availability or condition at any of the listed sources. Shop at your own risk. 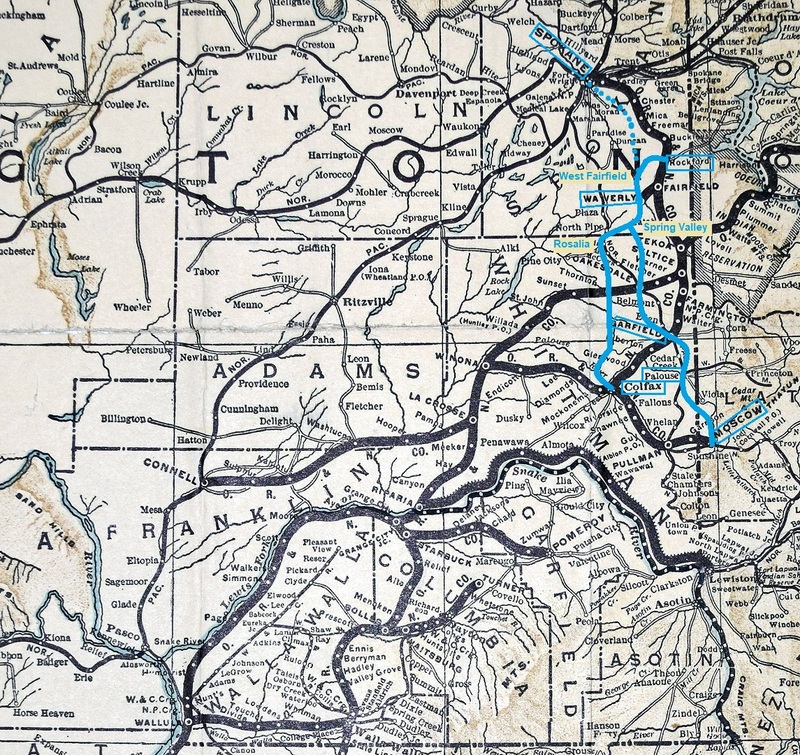 On page 10, my text creates some confusion over which railroad originally built the line connecting South Ainsworth with Wallula, and at which of those two points interchange between the Northern Pacific and the Oregon Railway & Navigation Co. actually took place. 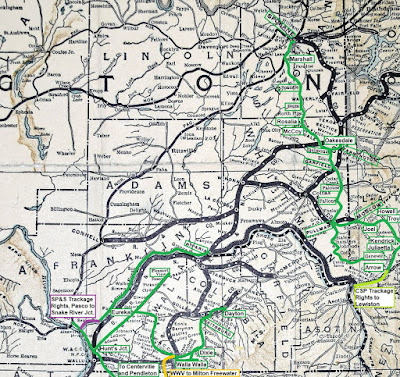 It turns out I was confused myself about these points, so I took another look at my sources including Jeff Asay's Union Pacific Northwest and Peter J. Lewty's To the Columbia Gateway: The Oregon Railway and the Northern Pacific, 1879-1884. Wallula was the western terminal of Dr. Baker's Walla Walla & Columbia River RR, where freight and passengers to and from Portland were transferred to the steamboats of the OR&N. In early 1880, Henry Villard and Hans Thielsen initiated construction of the OR&N's new railroad to Portland at Wallula. At this same time, the Northern Pacific had established Ainsworth on the north bank of the Snake River, right where the Snake empties into the Columbia River. 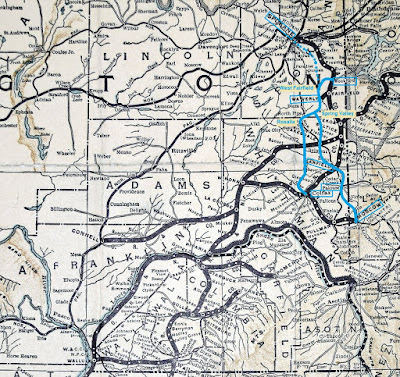 From here, NP forces were constructing its transcontinental line eastward to meet up with crews working west through North Dakota and Montana. Villard negotiated with the NP to reach an agreement in October 1880 that the NP would interchange freight and passengers with the OR&N at Wallula. Shortly after signing this agreement, the NP sent contractors across the Snake to begin building a line south to Wallula. The terminal point on the Snake would be known as South Ainsworth. According to Mr. Lewty, the NP built this line as narrow-gauge to match the 3-foot gauge of the WW&CR and the OR&N line running west from Wallula. This makes a deal of sense, since freight would need to be barged across the Snake until a proper railroad ferry, and later a bridge, could be implemented, so it really wouldn't matter whether the gauges matched. 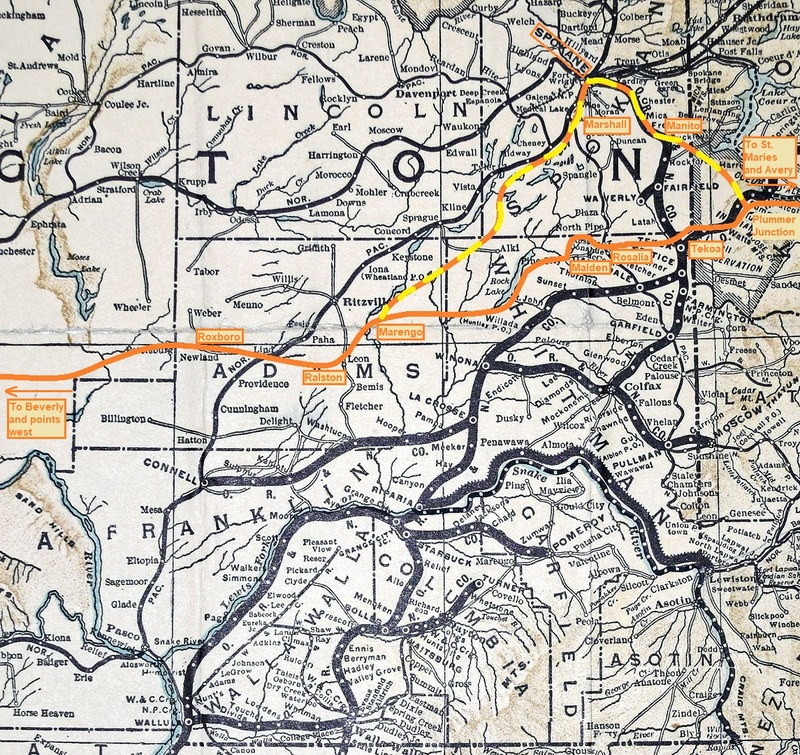 Although the Northern Pacific built the South Ainsworth-Wallula connection, OR&N trains operated the line while it was still narrow gauge. But, once the line was re-gauged (along with the Walla Walla-Wallula-Umatilla line) in May 1881 and the Ainsworth railroad ferry established in July 1881, NP crews took over. Also, the NP constructed a small yard and engine terminal at Wallula where OR&N-NP interchange took place. 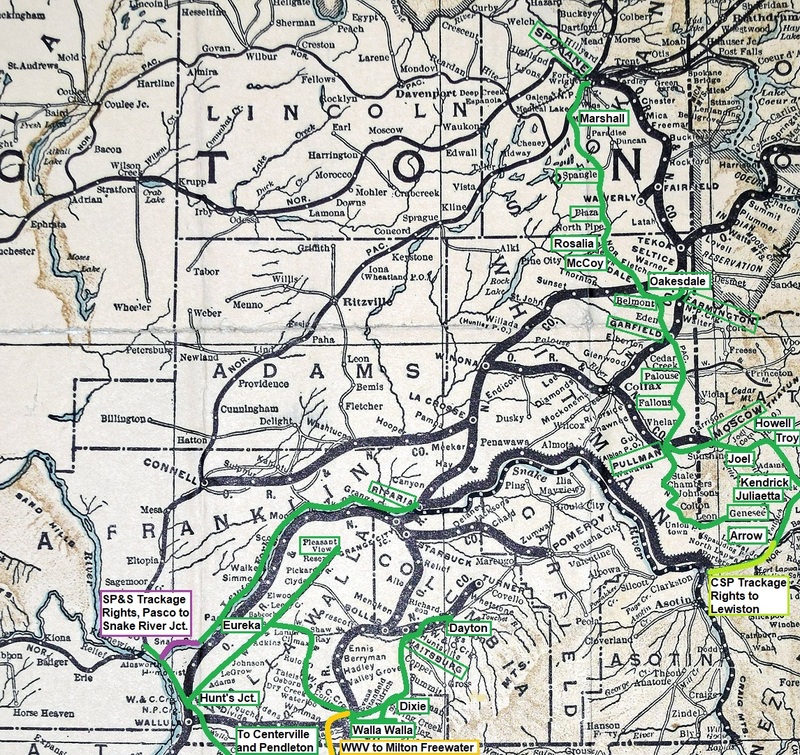 Wallula would also soon serve as the jumping off point for branches to Walla Walla and Pendleton, built by George Hunt's Oregon & Washington Territory RR but soon acquired by the NP. A few years later, after the OR&N had been reorganized as the Oregon Railroad & Navigation Co., the ORR&N built its new Yakima Branch parallel to the NP line for several miles until turning west and crossing the Columbia River to Hedges, near Kennewick. Upon completion of McNary Dam near Umatilla in the early 1950s, the original Wallula yards and much of the connecting tracks were submerged in its back pool. The NP, Oregon-Washington Railway & Navigation Co. (as its parent road, Union Pacific, had re-named it in 1910), and the US Army Corps of Engineers cooperated to re-configure Wallula. The NP line remained in place for much of its length, being relocated to a higher elevation only as the tracks approached the new Wallula. 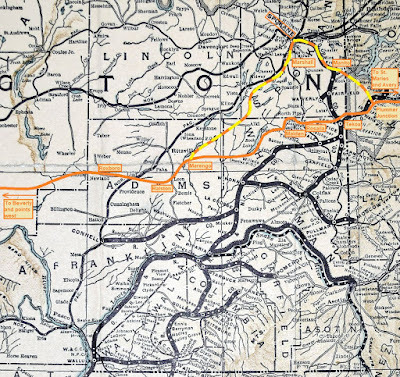 Union Pacific trains received trackage rights on the NP line north of Wallula as far as a new Villard Junction, where UP's Yakima Branch joined in. South of Wallula, UP trains also ran on NP trackage rights as far as Zangar Jct., where the UP continued east to Walla Walla and the NP south to Pendleton. 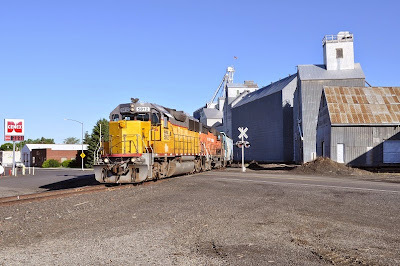 Today, BNSF owns and operates the branch from Pasco yard to Wallula, where BNSF trains then travel east to Ayer on the UP mainline for interchange with the Great Northwest Railroad. UP trains still have trackage rights as far as Villard Jct. In another attempt to assist readers of Palouse Rails: Granger Railroads of the Inland Northwest, here is a series of view-able maps covering each of the railroads that are the subjects of the book. Click on the link below each image, and a second window will open to the full-size image in my Flickr account. See the bottom of this page for notes regarding the maps. 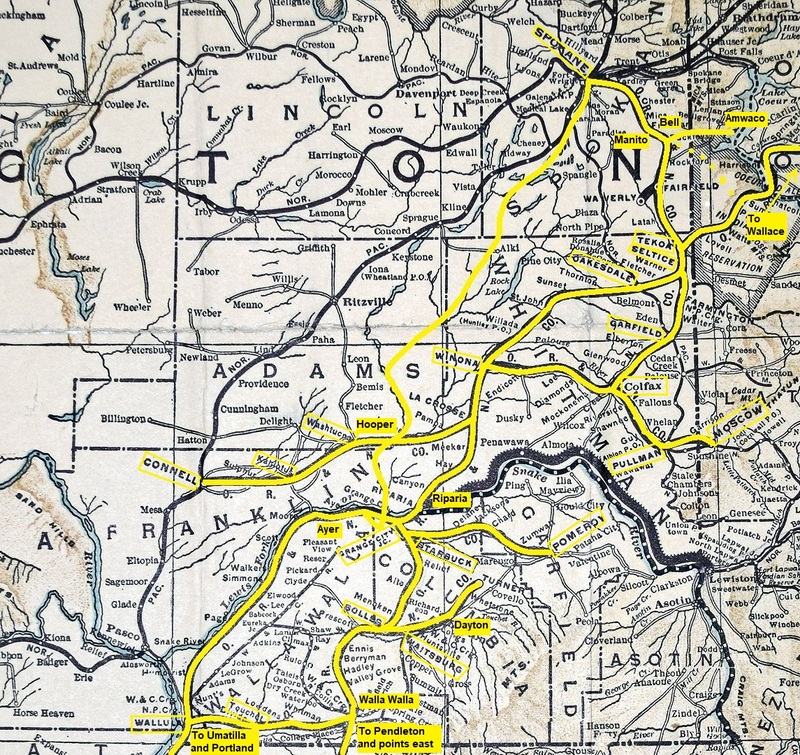 Note: the source map for most of the lines in question is a 1906 ORR&N promotional map from my collection. The darker black lines are those of the ORR&N, while other lines are shown as smaller black lines. Since some of the lines addressed in the book were not in place when this map was first published, I have attempted to show their approximate location relative to the lines that are included on the map. 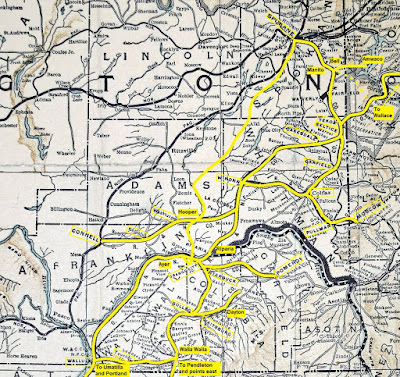 As I originally imagined my book, Palouse Rails - Granger Railroads of the Inland Northwest, it would include a series of well-detailed maps to help readers visualize how the railroads discussed in the book connected the various towns and other locations with the rest of the United States' rail network. However, in discussions with the publisher, Fonthill Media, it became clear including such maps within the allotted number of pages would mean many photos would be left out. To me, the photos are the most important part of any railroad book, so we considered options that would allow us to keep the photos in the book. The maps I used as references while writing the book came from a series of topographic maps in 1:250,000 scale issued by the U. S. Geological Survey. The most useful ones were those from the mid-1950s, when most of the Inland Northwest rail network was still intact. Together with the publisher, I decided to include a short author's note pointing readers to those same reference maps. This compromise would allow the photographs to remain in the book. The USGS sells full-size copies of these maps through its online store for about $15 each. But, what's really cool, is that you can download .pdf copies of those same maps directly to your personal computer for free. That's right, for FREE!!! 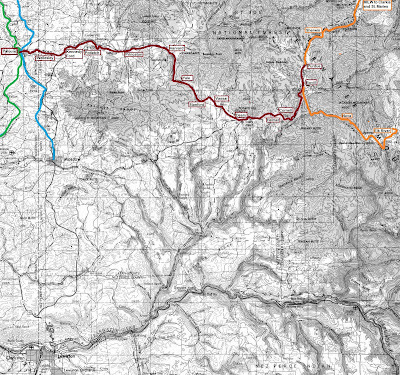 I recommend seven maps that together cover the full length of the railroad lines discussed in the book. 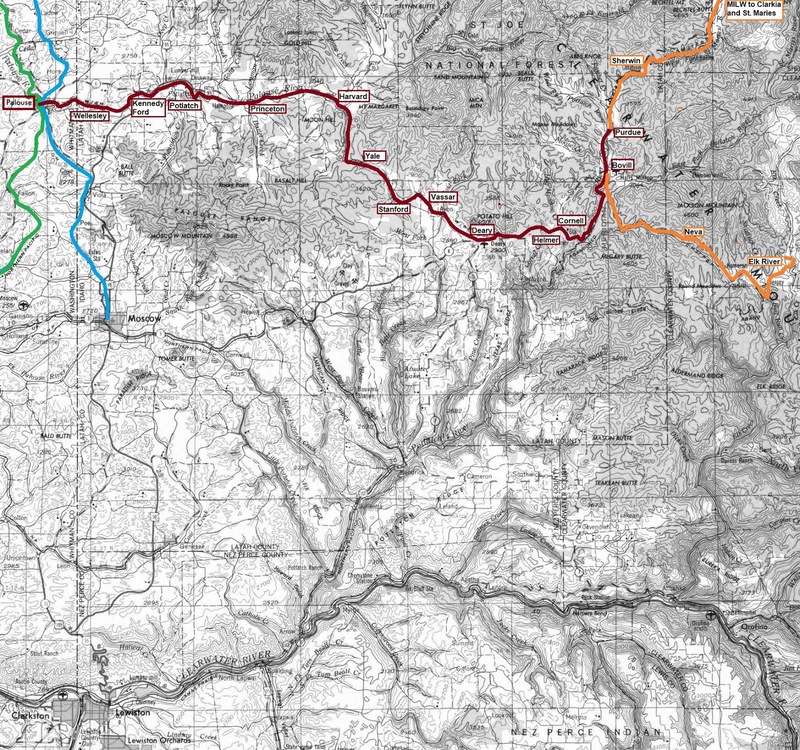 Two of them, Grangeville, ID and Hamilton, MT, show only the extreme eastern and southern ends of the Camas Prairie Railroad, but the rest are very helpful in following the book's narrative and in locating the places where photos were taken. 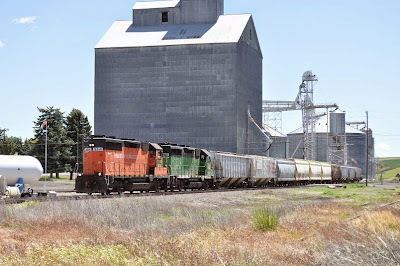 In late June of 2012, I had the extremely rare opportunity (for me, at least) to spend several days in the Palouse region of Eastern Washington and North Idaho with the express purpose of “chasing trains”. Normally, my paid vacation days are spent on family-related travel, so having a few days to my own devices is not that common and I intended to take full advantage of the situation. The primary reason for my visit was to attend the Milwaukee Road Historical Association being held in Moscow, Idaho that year. The convention was scheduled to begin on Thursday afternoon (June 28th), but I had arranged to leave my home in Richland, WA already Wednesday morning to maximize my time in the Palouse. I had two primary targets in mind for the trip: 1) the former Union Pacific lines leading east out of Hooper, WA, now owned by the State of Washington and operated by the Palouse River & Coulee City RR (PCC), and 2) the former Washington, Idaho & Montana Ry (WI&M) line between Palouse, WA and Harvard, ID, which is currently operated by the Washington & Idaho RR (WIR). I knew that both railroads operated these particular routes infrequently, usually only once per week. I had done some prior intelligence gathering, and based on this and prior experience, I guessed the PCC train would be running its “Grain Shuttle” on Wednesday and the WIR would serve the WI&M on Thursday. Still, there was no guarantee that I would be in the right place and time to follow either train. Railfanning the Palouse always involves a great deal of uncertainty and calculated risk. 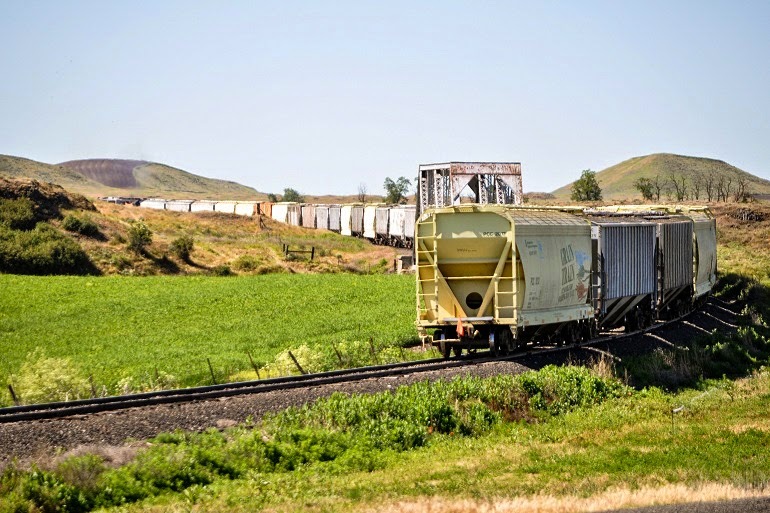 Sidebar: The “Grain Shuttle” program helps ensure that local wheat farmers have access to enough State-owned (or leased) grain hoppers that they can move the bulk of their harvest to market with few interruptions. And, by hauling full “grain blocks” of 26 or 52 cars, using Union Pacific trackage rights from Hooper to a barge loading facility on the Columbia River at Wallula, the railroad is able to charge farmers the lowest possible rates. In operation, the shuttle runs on a weekly cycle; the empty hoppers run from Wallula to Hooper on Mondays and then are delivered to the loading elevators east of there on Tuesdays. After the hoppers are loaded on Tuesday afternoon and evening, the Wednesday train gathers the loads and brings them down to Hooper for another mainline run on Thursday back to the barge elevators at Wallula. Since there are no other trains operating on the PCC’s Hooper lines any other time of the week, Wednesday would be my best shot for witnessing the shuttle train in action on the grain branches. Rising ridiculously early that morning, I departed Richland about 3:30 am to try and arrive at Hooper close to 5 am. Again from previous experience, I knew the PCC crew likes to get an early start, and I didn’t want to miss any of the action. Once at Hooper, however, the next step is figuring out where to find the train. The rails to the east run parallel with Highway 26 as far as the turnoff to La Crosse, and then country roads are sufficient to keep the line toward Winona in view for all but the last couple miles. Not seeing the train along this portion of the route was a good thing, since my main photography locations were farther to the east. By the time I reached Winona, the sun was up and the crew was likely on their power, already working their way back from whichever elevator had been their last stop the day before. The catch is that the line splits in two at Winona. The southernmost of the two routes still has tracks in place as far as Colfax, but the only customers are the elevators at Endicott, Thera, Diamond and Mockonema (there’s also a fertilizer dealer at Mockonema that receives chemical tank cars). This was once Union Pacific’s mainline to Spokane, but it has been downgraded and abandoned in sections over the years. It’s been a long, long time since the last PCC train made its way down the hill into Colfax, and that’s too bad. 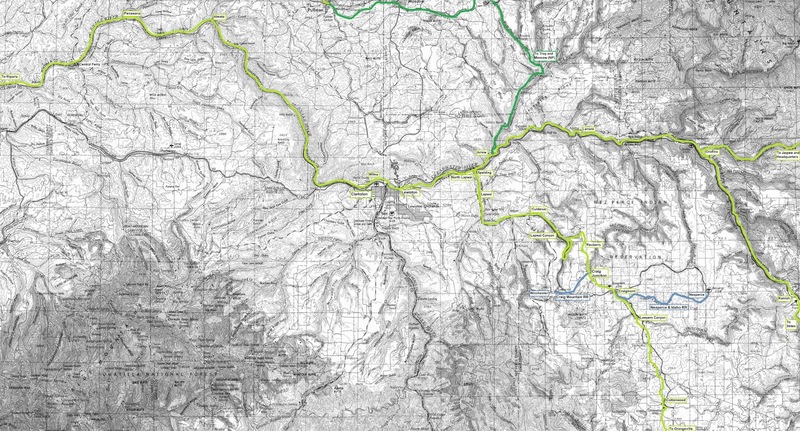 The more northerly route is the former Pleasant Valley branch, which once served as a low-grade bypass around the Palouse River canyon where Colfax lies. The PV terminates now at Thornton and serves elevators there and at Sunset, St. John and Willada. In addition, there are two elevators at Winona itself that ship via the grain shuttle. So, with two possible lines the train could be running on, and the clock ticking, knowing which way to turn here required a quick bit of reasoning: Since the crew probably spotted empty hoppers at one or more elevators on each of these two legs of the branch yesterday, there was a good chance I’d see the train on both routes at some point during the day. The two or three locations where I most hoped to photograph the train were on the PV, and if I missed out on those shots because I was putzing along the Colfax line to find a train that’s not there, I would kick myself later. However, if I missed out on photos along the Colfax line while searching for the train on the PV, it would not be as great a loss. So, I headed along the PV toward St. John. Reaching St. John with no sight of the train so far was a good thing, I hoped. I have been fooled before. I continued north toward Sunset and Thornton, when I spied a locomotive’s headlights heading toward me with another engine and a handful of loaded hoppers in its wake. After a cautious U-turn, the chase was on!! Of course, chase is a relative term. With allowed speeds of about 15 mph on the rail line, it was not difficult to take a few photos as the train passed one location, and then move forward to the next potential photo site without any real hurry. The first stop for the train was at St. John to add a few more hoppers to its train. The track arrangement here was not easy for the crew to negotiate, and it required several moves that temporarily stopped traffic on Highway 23, right at the apex of the horseshoe curve the tracks form as they wind through town. 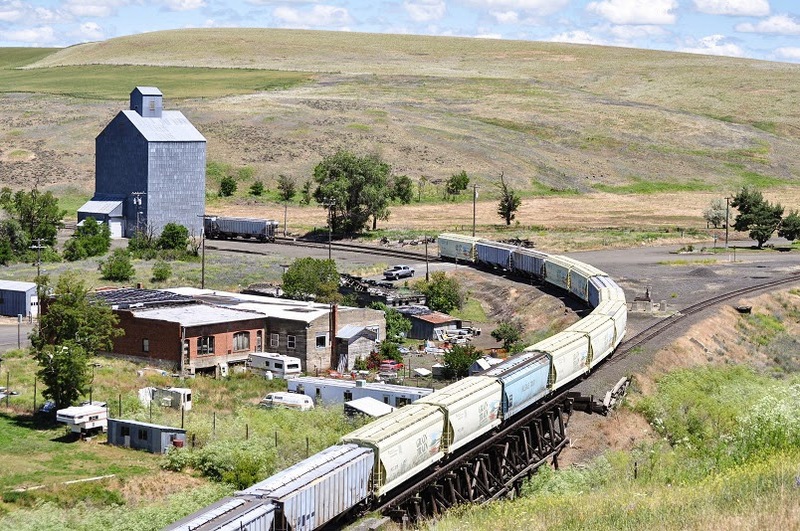 The Palouse River & Coulee City draws its locomotives from a fleet owned by its parent company, Watco. These all carry the same WAMX initials, but otherwise have little family resemblance, wearing a wide variety of paint schemes from former owners, including Amtrak silver, BN Cascade Green, and Watco’s once-standard orange and black. I was very pleased to find that the lead locomotive on today’s train still wore Union Pacific’s Armor Yellow and Harbor Mist Gray. With all the possible color combinations the WAMX fleet could produce, it was very nice I could capture a little of the appropriate color on a former UP line. 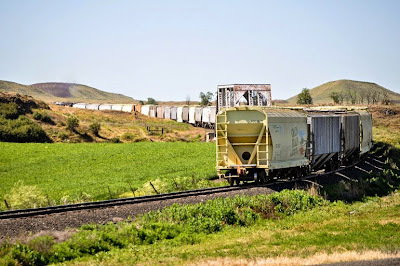 "I only wish the train had been long enough to really string out through the curve"
From there, I continued leapfrogging the train on its journey with only a brief pause while the crew switched the large elevator at Willada to fill out their train with additional grain loads. Once they arrived at Winona, the crew dropped most of the train on the PV leg of the wye track, and then pulled a single shuttle car from the small elevator in Winona itself. At this point, the crew tied down their locomotives and hopped in their highway vehicle. Following typical shortline operations in this part of the country, the crew consists of an engineer and conductor. However, the engineer is usually by himself in the locomotive cab while the conductor drives along the parallel highway, running ahead to set up switching moves and to perform frequent safety roll-bys at each road crossing. Having a truck available increases the crew’s flexibility as evidenced by their next move. I followed the crew vehicle east a few miles past Endicott to Thera, where two more locomotives were tied down with a string of freshly loaded hoppers on the elevator track. I quickly realized the crew had brought four engines up from Hooper to Winona the day before, and then had split their power to drop empties along both branches. Now following the same scheme in reverse, the crew started up these two motors and proceeded with coupling up to the loaded cars. Trundling west now at the same 15mph pace, the crew stopped at Endicott to pick up more cars before completing this leg of their run at Winona. As on the PV line, I found multiple locations to photograph this train due to its slow speed. At Winona, the crew did not hesitate to couple up all four locomotives, with the 5012 still in the lead, and merge their two trains into one. They moved so quickly, in fact, that before I knew it I had missed out on a chance to snap one of my desired photos. There is a high bluff to the south of the wye track at Winona, and it’s from this vantage that another photographer, Blair Kooistra, shot a photo in 1992 that I admire greatly and had hoped to replicate during this trip. But, by the time I found the right spot, the crew already had the full length of their train strung around the wye with the engines well past the spot where Blair shot the earlier train. As a consolation, I got some good shots of the four engines heading up the Palouse River Valley, one of which was later printed in Trains Magazine. "The crew already had the full length of their train strung around the wye..."
From here, I raced ahead to photograph the train approaching and cruising through La Crosse. I really wanted to shoot photos on the route back to Hooper, but I also didn’t want to press my luck. My plan for the rest of the weekend hinged on staying in a particular campground in the mountains east of Moscow, and there was some concern that if I didn’t head that way soon, I might miss out on a campsite. So, as the train headed under Highway 26 and made a right turn toward Hooper, I made a left at the highway instead, hoping that all my other plans would go as smoothly as they had this day. I was not to be disappointed. As with any project like my book Palouse Rails - Granger Railroads of the Inland Northwest, there are bound to be a few, hopefully minor, mistakes that will slip into the final product. I wish it were otherwise, but despite my best efforts, those errors have already cropped up in the advance copy of the book I received a few days ago. This entry of my blog will be used to capture as many of the mistakes as possible and provide an ongoing source of the corrected information. Page 40: Tilma was the station name assigned to a cluster of elevators and warehouses straddling the Washington/Idaho state line just east of Tekoa on the original OR&N line to Plummer and Wallace. On maps, this same location is shown as Willard. When UP abandoned the line east of Tilma, the end of track lay on the Idaho side of the line to ensure continued rail service to those warehouses sited within Benewah County. As written, the text would imply the Tilma spur ended on the Washington side. Rail historian Robert Leachman added this tidbit to an online discussion regarding the topic of Tilma: "In 1975 I briefly served as UP agent at Tekoa. If I recall correctly, during my two-week tenure there UP got exactly one load out of the Tilma elevators. Because the elevators were across the state line they were subject to ICC rates rather than WSDOT rates. And if I recall correctly, the station name in the tariffs was Tilma. I think the bill of lading read 'Tilma elevator, Tekoa station.'" Page 71: Lower Granite Dam is located approximately 33 miles downriver from Lewiston, ID, not 42 miles as stated. Page 140: The caption information for the two photos got swapped. The upper caption applies to the lower photo and the lower caption applies to the upper photo. However, the photo credits are correct for both photos. I am a Mechanical Engineer. You know, the kind of engineer that sits at a desk with a computer mouse in hand, all the time wishing he were the kind of engineer that sits at a locomotive control stand with a throttle lever in hand. In addition to my interest in railroads, I am a husband, father, and accidental owner of 4 cats when I'd really rather have a dog.